In Sanskrit, an Ayurvedic massage or a full body massage is known as Abhyanga. The word is nothing but a combination of Abhi meaning ‘towards’ and anga meaning ‘movement’. It is commonly referred as an exotic ritual which involves massaging the body in a particular direction. Abhyanga can be carried out with oil, herbal paste or herbal powder. As it prepares the body for Panchakarma, it aids in mobilizing the dosha and tries in eliminating them through the orifices across the entire body. Primarily, an Abhyanga massage certainly helps in pacifying the Vata, Pitta and Kapha dosha. In fact, such kind of a massage comes under the treatment that can be thought for balancing the dosha. Interestingly, the Ayurvedic self massage comprises of techniques such as ‘samvahan’, peedan’ and ‘mardan’. Initially, the therapist rubs the body gently and starts applying pressure with the help of the fingertips. 2.13.1 Was this article helpful? Step 1: Before you start off, you need to heat a quarter cup of massage oil in a small container till the oil becomes slightly warm. Step 2: Later, you need to pour some oil on the head, and start dabbing it with gentle strokes. For the amazing experience, you should never forget to carry out the strokes in a circular motion. Step 3: Soon after massaging the head and the outer parts of the ear, you should start smearing the oil over the rest of the body. Step 4: After some time, you need to massage the front and the rear portion of the neck with gentle hands. Step 5: Later, you should massage your arms, chest, and stomach. Make sure you apply less pressure around the heart and think about circular motions across the pectoral region. Step 6: Afterwards, you need to massage your back as much as you can with firm strokes. Step 7: Once you are done with the upper body, you should spend more time in massaging the feet, hips, and legs. While you apply more pressure around the soles, the toes can be massaged just as you had done with the fingers. Step 8: Towards the end, you should have a shower for at least 20 minutes. While you are bathing, you shouldn’t use soap but use black gram flour or Triphala powder. Step 9: Now, you must stay under the shower till the oil trickles down and the skin has been nourished in a better way. Step 10: For removing oil from your hair, you first need to apply herbal shampoo and rinse your head thoroughly. In the end, you need to wipe your body dry with a clean towel. It’s always better to use a fresh towel or else your skin might become oily with the one you had used for the massage routine. If you are wondering which oil you need to use for Abhyanga Massage, then it totally depends on the dosha. For Vata dosha, you need to use Sesame, olive or castor oil. But, if Pitta is the dominant dosha, then it’s preferable to use coconut or sunflower oil. For a body with Kapha constitution, you need to use mustard, corn or olive oil. Apart from everything else, the type of oil can also be decided on which body part you wish to massage. If a therapist is going to massage the body, then you should request him to proceed with the therapy inside a clean and well-ventilated room. Depending on the outdoor temperature, you can decide whether you need to heat the oil. But, if Pitta dosha is dominant within you, then it’s always a good idea to use oil at room temperature. Abhyanga is always considered before Panchakarma, the detox therapies based on Ayurveda. Moreover, it serves to be a protocol for different conditions and diseases. So, as the expert massages the entire body with herbal or sesame oil, the therapy offers numerous health benefits. 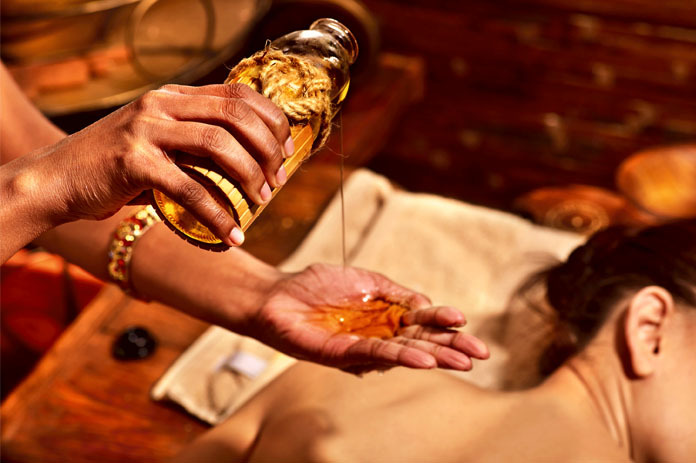 According to a study, Ayurveda Abhyanga massage always helps to relieve the individual from stress. Consequently, the therapy aids in reducing the blood pressure and regulating the heart rate. So, if you are facing health issues because of hypertension, then you should always opt for Abhyanga massage. In case you are massaging an infant, then the anointing with oil aids to strengthen bragma. This eventually serves to be an effective remedy for Cerebral palsy, a neurological condition that affects movement. The child also feels happy during the session if a cotton pad soaked in oil is kept on the head. If the person massages his feet with herbal oil 20 minutes every day, then it certainly helps in driving away the burning sensation, a symptom of diabetic neuropathy. Although the sensation might recur in future, the severity would be quite less as it was before. If you are going for a foot massage, then the oil can help in soothing cracked heels as well as its roughness. As the skin texture is considerably improved, the person would no longer experience pain due to cracks present along the feet. In fact, as the oil seeps inside the cracks, the length of the cracks is considerably reduced. Abhyanga massage always contributes towards weight gain in case the infant is weighing less than the usual reading. While babies would be able to adapt themselves to stimuli, the massage adds on to growth and the overall development. Regular massage can also help to improve the behavior of the child. As the child’s mood is improved, the parent doesn’t have to worry about Attention deficit hyperactivity disorder and development disorders that impact interaction. Massaging with oil time and again can be the best remedy to combat Sandhi Vata / Osteoarthritis. The person would certainly be relieved from pain due to the slight pressure applied at certain points. If a person is suffering from paralysis across the vertical half of the body, then relief could always be sought through Abhyanga massage. Hemiplegia can always be improved with Mahamasha Taila (herbal oil) Abhyanga and bolus massage using rice and milk followed by Mustadi Rajyapan Basti (herbal decoction used in enema therapy). If the person undergoes the treatment for a longer time, then the therapies also strengthen the wrist and the fingers. A massage can always be a good option when a chiropractic treatment has to be considered for chronic back pain. After a few sessions, the person can expect the benefits to last for six months. If the child receives a full body massage along with bolus massage for a period of six months, then the total Creatine Phosphokinase level is always reduced. In the end, the parent would happy as the calf muscles become less rigid, and the child gains the capability to walk and climb. A massage therapy can always help in reducing a depressed mood of a pregnant woman. This change is observed because the dopamine and serotonin levels get increased after the session. On the other hand, the woman is bound to feel happy as she observes a drop in the level of cortisol and norepinephrine. As the sleep quality is improved through a massage, the therapy always helps to get rid of Migraine sometime later. In fact, among the most effective remedies, Abhyanga massage is known as a non-pharmacological treatment for conditions like Migraines. As the massage is effective in reducing stress and anxiety, it’s obvious that the therapy induces a sound sleep. Moving ahead, the treatment helps to overcome insomnia and reduce restlessness especially in case of postmenopausal women. Once a child receives a massage, he or she would never face an itching sensation on the skin. In fact, continuous massage with the oil makes the skin soft and tender. However, it’s never a good idea to give a massage when the skin is swollen or the condition is quite worse. Before concluding, a person should never go for Abhyanga massage in case he or she is suffering from dehydration, a bleeding disorder or an acute illness. The therapy should never be thought about if the person is pregnant or has undergone a treatment through chemotherapy.